The plan announced by Treasury Secretary Timothy Geithner could mobilize well over $1 trillion in public and private support to get the frozen credit markets functioning again. It includes a government-private sector partnership to help remove banks' soured assets from their books. The major stock indexes fell more than 5 percent Tuesday, with the Dow tumbling 382 points - reflecting Wall Street's growing concerns about the government's ability to restore the health of the banking industry. Investors are frustrated with the government's latest bank bailout plan — and showing it by unloading stocks. Traders and investors said the lack of specifics from Treasury Secretary Timothy Geithner on how the government would direct more than $1 trillion in public and private support was troubling. The plan is aimed at restoring proper functioning to credit markets, which seized up over worries about bad debt after the September bankruptcy of Lehman Brothers Holdings Inc. The latest plan calls for a government-private sector partnership to help remove banks' soured assets from their books. The plan also would boost an effort to unclog the credit markets that govern loans to consumers and businesses. Funding for the effort would jump to $100 billion from $20 billion. "The good news is they are going to spend a trillion dollars, the bad news is they don't know how," said James Cox, managing partner at Harris Financial Group. "They built this up as being a panacea," he said. "There was so much hope pinned on them to do a good job. The expectations have been so high. It's hard to live up to." Investors also questioned whether this plan, which followed previous efforts in the final months of 2008, would work. Some selling was to be expected, however, as stocks rose sharply last week ahead of the announcement. Geithner's speech "basically puts a spotlight on the fact that the government has no idea how to fix the problem," said Jeff Buetow, senior portfolio manager at Portfolio Management Consultants. "People bought on rumor and hope, and now they're selling on reality." Investors focused on the financial rescue showed little reaction to the Senate's approval of its $838 billion economic stimulus package. The bill must now be reconciled with an $819 billion version passed by the House. Congressional leaders hope to have the bill on President Barack Obama's desk before a recess next week. "The economy is in deep trouble. The stimulus plan is not very stimulative. It's not addressing the real problem," Buetow said. "We have an insolvent financial system. The government is trying to find a comprehensive way to save it. They can't afford to just throw money at it. That's what they tried to do in the fall and that clearly did not work." Stocks extended their slide after Federal Reserve Chairman Ben Bernanke didn't elaborate on the plan in testimony at a House Financial Services Committee hearing. Instead, Bernanke said the programs designed to revive the credit markets are showing promise and that any fix to the worst financial crisis since the 1930s would take time to work. Bond prices jumped as investors sought the safety of government debt. The yield on the benchmark 10-year Treasury note, which moves opposite its price, fell to 2.83 percent from 2.99 percent late Monday. The yield on the three-month T-bill, considered one of the safest investments, slipped to 0.31 percent from 0.32 percent late Monday. Financial stocks led the market lower Tuesday, reflecting Wall Street's growing concerns about the government's ability to restore the health of the banking industry. All the major stock indexes fell more than 2 percent, including the Dow Jones industrial average, which tumbled almost 400 points. It also would boost an effort to unclog the credit markets that govern loans to consumers and businesses. Funding for the effort would jump to $100 billion from $20 billion. Investors also seemed to be questioning whether this plan, which followed previous efforts in the final months of 2008, would be the one that works. Some selling was to be expected, however, as stocks rose sharply last week ahead of the announcement. Investors showed little reaction to the Senate's approval of its $838 billion economic stimulus package. The bill must now be reconciled with an $819 billion version passed by the House. Congressional leaders hope to have the bill on President Obama's desk before a recess next week. Investors found little comfort in comments from Federal Reserve Chairman Ben Bernanke. He said in prepared remarks for his testimony at a House Financial Services Committee hearing that the programs designed to revive the credit markets are showing promise. He also pledged to keep Americans better informed about efforts to battle the worst financial crisis since the 1930s. 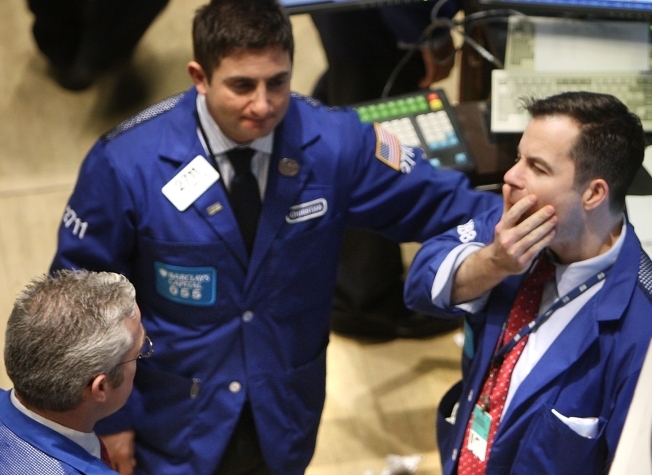 In early afternoon trading, the Dow industrials fell 316.36, or 3.82 percent, to 7,954.51. Broader stock indicators also fell. The Standard & Poor's 500 index fell 34.50, or 3.97 percent, to 835.39, and the Nasdaq fell 49.79, or 3.13 percent, to 1,541.77. The Russell 2000 index of smaller companies fell 14.09, or 3.01 percent, to 453.85. Declining issues outnumbered advancers by about 5 to 1 on the New York Stock Exchange, where volume came to 746.1 million shares. Bond prices were mixed Tuesday. The yield on the benchmark 10-year Treasury note, which moves opposite its price, fell to 2.88 percent from 2.99 percent late Monday. The yield on the three-month T-bill, considered one of the safest investments, was unchanged from late Monday at 0.32 percent. The dollar was mixed against other major currencies. Gold prices rose. Light, sweet crude rose 27 cents to $39.83 on the New York Mercantile Exchange. A government report that wholesalers cut back on their inventories in December by the largest amount in 16 years also weighed on the market. The reduction means wholesalers ordered fewer new goods, leading to reduced production and potentially more job layoffs. The Commerce Department said wholesale inventories plunged by 1.4 percent, nearly double analysts' expectations of 0.8 percent. It also was the fourth straight monthly decline. "I think generally we just don't know enough. We just don't know enough of what it all means," said Jon Biele, head of capital markets at Cowen & Co. "It's digestion time." Bank stocks fell after the bailout plan was announced. Bank of America Corp. fell $1.11, or 16 percent, to $5.78, while Wells Fargo & Co. fell $2.19, or 11.5 percent, to $16.87. Regional banks showed big drops. Fifth Third Bancorp fell 60 cents, or 21 percent, to $2.29, while Huntington Bancshares Inc. fell 59 cents, or 23 percent, to $2.02. Conglomerate General Electric Co., which has a big finance arm and often trades like a bank stock, fell 97 cents, or 7.7 percent, to $11.67. Principal Financial Group Inc. fell $4.81, or 28 percent, to $12.22 after the insurer posted a fourth-quarter loss on investment and loan losses. The company's report raised fears that the company will be forced to raise cash. More downbeat corporate news served as unnecessary reminders of just how bad the economic situation remains. Alcoa Inc. fell 54 cents, or 6.4 percent, to $7.96 after a ratings agency slashed the aluminum producer's corporate credit rating. Standard & Poor's Ratings Services said it expected the company's credit metrics to deteriorate significantly this year. General Motors Corp. said it will cut 10,000 salaried jobs in 2009, as part of the restructuring plan the company submitted to Congress late last year. GM rose 2 cents to $2.85. Airplane maker and defense contractor Boeing Co. late Monday lowered its reported fourth-quarter and fiscal 2008 earnings per share results, citing lower aircraft values in its customer financing portfolio and increased liabilities linked to an arbitration ruling. Last month, the company reported a surprise fourth-quarter loss and announced plans to cut 10,000 jobs. Boeing fell $2.38, or 5.6 percent, to $40.42. Meanwhile, Intel Corp. announced plans to spend $7 billion upgrading its U.S. factories during the next two years. The chip maker's move was a welcome dose of confidence for the economy. Intel fell 48 cents, or 3.2 percent, to $14.43. Overseas, Japan's Nikkei stock average fell 0.29 percent. In afternoon trading, Britain's FTSE 100 fell 2.19 percent, Germany's DAX index fell 3.46 percent, and France's CAC-40 fell 3.64 percent.